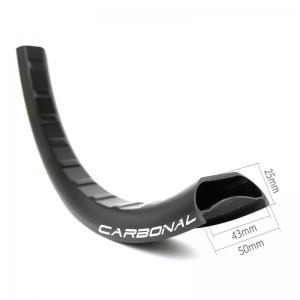 Carbon fiber plus bike rims are 50mm external width and 25mm deep, specially designed for plus bike. 50mm outer and 43mm inner width provides a stable platform which is with ideal size for 2.8"~3.0" tires. The wider profile allows for lower pressure and higher volume which results in increased bump absorption and incredible traction. Tubeless setup is a breeze with an extra-deep center channel and bead lock ridges to keep the tire perfectly secure. 650b - symmetrical rim profile - MX750, 25mm deep, 50mm external, 43mm internal, 470g. 29er - symmetrical rim profile - MX950, 25mm deep, 50mm external, 43mm internal, 510g. These plus bike carbon rims are available in center and offset drilling. Item MX750, weight 470g, ERD 557mm. A new wider, this 27.5 inch plus carbon rim is 43mm internal width providers a better platform for your favorite wide & plus tires. 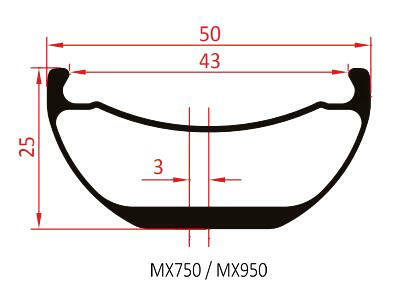 Item MX950, weight 510g, ERD 595mm. A new wider, this 29 inch plus bike carbon rim is 43mm internal width providers a better platform for your favorite wide & plus tires.